The Federal Highway Administration, during the first two rounds of its Every Day Counts (EDC) initiative, EDC-1 and EDC-2, promoted prefabricated bridge elements and systems to help improve quality and durability and shorten onsite construction time. Prefabricated bridge elements, however, need to be connected onsite, and the overall benefit of using prefabricated bridge elements is limited by the quality and durability of those connections. To address this issue, FHWA is promoting ultra-high performance concrete (UHPC) in EDC-3 and EDC-4 to improve the strength, simplicity, and durability of prefabricated bridge element connections. This innovation builds on the experiences of early adopters, starting in 2009 and continuing today with implementation by dozens of States across the country. UHPC is a fiber-reinforced concrete with mechanical properties that exceed those of conventional concrete. The common ingredients of UHPC include Portland cement, supplemental cementitious materials such as silica fume and fly ash, fine aggregate, superplasticizer, steel fibers, and water. These ingredients are used to varying degrees in conventional concrete. What greatly differentiates UHPC from conventional concrete, however, is the amount of cementitious material, the type of aggregate, and the fiber content. According to FHWA’s Ultra-High Performance Concrete: A State-of-the-Art Report for the Bridge Community (FHWA-HRT-13-060), UHPC can have 2.5 times more cementitious material than conventional field-cast concrete. Most commonly, only fine aggregates such as sand and glass powder are used in UHPC, creating a gradation that, when combined with the cement, provides a dense matrix with a discontinuous pore structure that prevents moisture from penetrating the concrete and significantly reduces permeability compared to conventional concrete. Steel fibers are not commonly used in bridge concretes, but UHPC often has steel fibers amounting to 2 percent by volume. At 2 percent, the amount of steel fiber in UHPC is comparable to the amount of reinforcing steel bars often used in conventional field-cast bridge concrete. Read more about UHPC, learning how to offset the higher costs, the types of connections its most beneficial for, and much more at FHWA’s Public Roads. Ultra-high performance concrete, like that being poured by these workers on I–81 to connect bridge panels, can improve the quality and durability of connections between precast bridge elements. 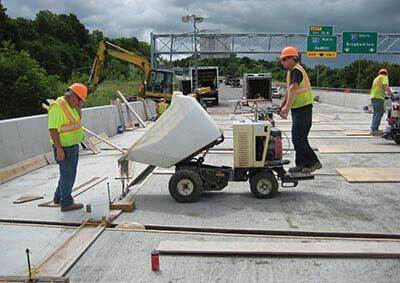 Photo: FHWA.